I trust that this site will be a resource for studies that confirm God's reality and the validity of the Bible; and help in explaining some of the gnatty little questions concerning God, the Bible and Christianity. Straight Talk about God is a non-threatening, friendly place to confirm God and build the confidence to act in trust of His word. Straight Talk is not affiliated with any denomination and generally shuns traditional Christian practices and doctrine. Straight Talk is founded on the teachings of Paul, along with those of Dr. Gene Scott. And MUCH independent study. Straight Talk about God is fulfilling Ephesians 4:12, which says that "the work of the ministry" is "the edifying of the body of Christ." In other words, as C S Lewis says, we're supposed to "show off God to each other." That's what this web site aims to do. Jesus told us that no one can come to God unless the Father "draws" him. If you're reading this, then you were "drawn" here and will most likely find the answer to a question that you have about God. Here's what I believe: Through the evidence of God's hand on the stage of history, His irrefutable creations and His working in my personal life, I gain the strength I need to overcome daily adversity, know His Word is forever settled in heaven, and that He will stand by me. Be sure to see Fifty Pieces, a book of essays on the practical side of the faith walk. 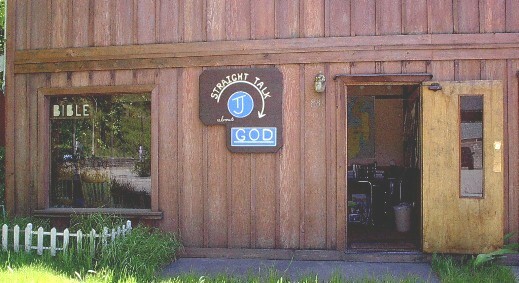 Listen to Straight Talk about God the first Sunday of every month from 9:30-10:30 a.m., Pacific (California, USA)Time. Jack deals with all the subjects on this web site plus topical issues confronting us such as the United Nations move toward One World Government, the coming Cashless Society, and more. If you learn something here and feel like helping me reach others, there's a donate button at the bottom of the page. STRAIGHT TALK ABOUT GOD VIDEO!! For the 24 Lost Tribes video series, just type in, Jack Flaws - YouTube, or Lost Tribes of Israel-Jack. The Video Archive contains The Resurrection, Communion Complete, and What's God Doing? contain much greater depth than the radio presentations. Lost Tribes links. This third video channel, Jack Flaws, contains a diverse series of short videos called God In 10 Minutes. These are meant to be introductory videos to much larger areas of study. The idea is to show the supernatural influence in the Creation; God's reality. There will probably be 17-20 subjects covered and also longer videos will be added. Just type in Jack Flaws or God In 10 Minutes. Video links. The Straight Talk Radio Archive! Still in progress, this archive now contains over 350 past Straight Talk radio broadcasts. There is also a section currently containing 85 Transcriptions of Straight Talk shows. I thought it might be convenient to have a central place where additions to Straight Talk could be easily accessed. These pages are also in their respective categories, but this way you won't miss a new page because it's "buried" in a different place on the site. There's a lot of stuff on this site. I hope this "staging area" has been helpful. Thanks for trying it out. I'll rotate in any new pages as they fall out. And I guess the new links will stay for a few months, at least. Is there a Believer alive who hasn't heard someone say, "I accepted Jesus Christ as my personal Lord and Savior?" Is that really what happened? The common "formula" for being saved is to confess one's sins/sinfulness, and ask Jesus or God to forgive them. I've never heard anyone say that they were sitting around at coffee and Jesus showed up and asked if he could be their savior. Do the people who parrot this sentence ever realize how it sounds to the listener? What a grand statement of ego. And I've certainly heard it said when it meant, "I'm better than you." We've heard that each person in the Body has a unique and irreplaceable function. We know from Ephesians 4 that this function is the building up of the Body, edification. This must mean that we are to focus our efforts on believers. What will reach believers? The Gospel of salvation? They've already heard and accepted that. It's All About The Kingdom. All a Believer's time, energy and money that is pointed at God, must go for the edification of the Body of Christ. Twenty-five percent of a Believer's life is to be spent in pursuit of God's Objective. God's Objective has always been to set up a Kingdom here on earth. The angels that fell were part of that process. God is using a certain 7000 years of history to fill the void left by those fallen angels. Have you ever noticed that there seems to be more than one Gospel in the New Testament? Are they all the same? The Bible talks about the gospel of God, the gospel of Jesus, the gospel of hope, the gospel of salvation and more. The gospel of God must take precedence over any other gospels. God sent Jesus to earth to deliver a message(gospel) to humanity. It was God's message, not Jesus' message. This message is easily found by studying all the preaching and teaching that Jesus did. The encounter by Abram with Melchizedek is obviously the first type of Communion in the Bible. What about the tithes that Abram paid to Melchizedek? It would definitely imply that Melchizidek was Abram's teacher in God things. It would also imply that this was not their first meeting. This conclusion can be reached by only applying these three Principles of God's Walk. God is real, faithing and pay the teacher. God is a spirit. The devil is a spirit. The Angels are spirits. And You are a spirit. If You are a spirit, what is your body? Your Self, your Spirit, You, manipulate energy to form a tool that allows You to experience the physical reality. That tool is your physical body. Your physical body is not You. This idea is nothing new. It's been taught since there were people. The point is not that your body, your brain, your mind is not You. The point is why we have bodies at all. Extending outward, the point is, why is there a physical reality? ALSO FEATURED AT THE ARCHIVE: TRANSCRIPTIONS. With the help of two Angels, this section of Straight Talk is up and running strong with some 80 transcriptions ready to read. There are ten programs in the Lost Tribes Series, twenty on the Illuminati and programs of various other subjects. The most recent transcriptions are listed below in the Archive section. Nine transcriptions of New World Order programs. These were broadcast as long ago as 1997. Interesting how the stuff we talked about is now in place. Also now available is an audio version of Fifty Pieces, A Personal Walk of Faith. This version is held on one CD and is formatted in MP3. The individual pieces are separated into their own tracks. If your MP3 player lacks Fast Forward and Reverse, you won't have to start at the beginning of the book each time. There are 56 tracks altogether. I have also transferred Fifty Pieces into PDF format. This is convenient for searching the text and for printing individual pieces. I've added a new section to the Archive. It's called Recent. It will contain the last ten to twenty programs. These programs will eventually rotate into the appropriate categories, but I will always leave the ten most recent programs in the section. I've got four short essays to share with you today. How to attain peace of mind. What it's like to be God. The parts of God and why He made up the Sabbath. We're in our bag of Bible tools again this time. We'll be looking at symbolism, by way of a couple Old Testament prophets, Hosea and Ezekiel and spend sometime in Revelation. We're here to show 1, don't make symbolic what isn't. 2-Symbolis describes literal events, not some change of attutude. 3- Symbolism, as with literalism, MUST be judged by the context of he passage. There are two main ways we encounter symbolism. First, there are literal events which symbolize other literal events. Second, there are symbolic, non-literal events that symbolize literal events. With Easter coming up, it's time to look again at the resurrection of Jesus. We'll even hear what famous historical figures had to say about Jesus, like Goethe, H.G. Wells and Napoleon. As you may know, these men weren't pillars of the Christian church. Easter has nothing to do with Jesus. It's one of those pagan holidays grafted on to the early church at Rome, in order to grow the congregations with pagan worshippers. If you want to celebrate the resurrection, then do it at Passover. That's the time when those things happened. Included, just for fun, are two episodes of Captain KMUD as part of the current pledge drive of KMUD. Here's number three in our series on understanding the Bible. This is the first half of a full video I produced. Last time we touched on a few of the prophecies to the 12 tribes and saw that the House of Israel are not the Jews. We mentioned a few promises that went with the birthright. Today we're going to get into a lot of detail in the prophecies, which prove that Britain and northwest Europe, plus the US are really the lost tribes of the House of Israel. These prophecies cannot be found fulfilled by the Jews. Today, we'll get deeper into the prophetic books to see what they said would happen to the other tribes. You'll want to take some notes on this stuff. You can read while you listen. We're getting back to the series on understanding the Bible today. We were making our way through the prophets last time. This part is the second half of the full video I produced, and as I said before, the sound is going to be a bit different because of the use of different microphones. Before we start, let me remind you that the ten Lost Tribes are not Jews. And that most all the prophecy in the Bible is made to those ten tribes. They became the traditional Christian nations of northwest Europe and the British Isles. We'll pick up at Jeremiah. read while you listen. This is the second installment of the series called Understanding the Bible. Bible prophecy is one of the most confused areas of the Bible. It takes some study to tell to whom the prophet is speaking, what he is saying, and when the prophecy will occur. To be understood, five sevenths of the Bible depends on the knowledge of the Lost Tribes. But since most of Bible prophecy is directed at the House of Israel, we must know all the many names of that people or we'll be looking for the Jews to fulfill the prophecy. The House of Israel is NOT the Jews. You can read while you listen. I'm going to start a series today called "Understanding the Bible." Today we'll start with some general principles. As they say at the ball game, you can't know the players without a program. Then we'll spend a few minutes showing that we can know the exact ddy that Jesus was born. And it wasn't December 25th. You can read while you listen. The Anatomy Of A Faith Act: Faith at the Speed Of Thought! Don't Initiate, Only Wait: Things That Fall Out Of The Sky. The Key to Life with God: DWIFOY and FOOTS. The Bottom Line Of Christianity Giving. 12 Part Frame of Reference Study of Salvation. English Gematria - It's Real!! A Jesus Christ New Years Eve. HEROES OF FAITHing Bible stories for adults, written so young people can understand. Fifty Pieces A book of essays dealing with eight diverse Christian topics, five of which are represented on the Fifty Pieces page. One or two pieces are offered in each category, plus an Appendix which contains a synopsis for each piece in the book. Fifty Pieces answers often asked questions about God, the Bible and Christianity. Fifty Pieces also contains study helps for understanding the Bible and outline notes for discussion topics. 400 pages. It was the information on the Lost Tribes that brought me back to God. I grew up in the Baptist church, but left as soon as I was big enough. I BELIEVED them when they said that Catholics weren't Christians!! It was, and is, a good place to be from. I was going my own way up here in Pot country (northern CA); The Emerald Triangle, so called. Doing very nicely, too! Then I bought a satellite dish to counter the bad reception of our two very commercial TV stations. Only had the dish a couple weeks when I ran into Dr. Gene Scott. Shortly thereafter he began teaching on the Lost Tribes. It was the first SOLID thing I'd heard about God in 45 years. I've studied, taught, written a book and done radio broadcasts on the subject over the last 24 years and I still get turned on by the whole thing. I know that acting in faith, faithing, is not only the single thing, we Christians must be about, but I also know that faithing is the most difficult thing we can do. It takes great amounts of courage to step out toward the unknown. That kind of courage, which can only come through a psychological certainty of God's reality, is what we need when facing doubt and adversity. No psychological certainty comes without looking at the evidence. Hard historical, archeological evidence, plus a simple understanding of human nature can supply such a psychological certainty. A short synopsis of each piece is contained in the Appendix on the Fifty Pieces Introduction Page. Return to Subjects of Study at the top. Remember to tune in to Straight Talk about God every first Sunday of the month from 9:30-10:30 a.m., Pacific Time. Straight Talk is now hooked up to PayPal for your convenience. Thanks for your support. Thank you so much for your interest. Let's get together again. Pastor Scott 24 hours a day!! !